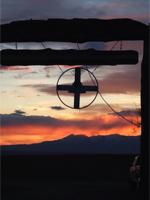 The Buffalo Woman Ranch is nestled in the four corners area of southwestern Colorado and includes 50 acres of remote pristine land. Tranquil and powerful in its essence, the ranch is located near Dove Creek, Colorado. It is about 45 miles north of Cortez, Colorado, 8 hours southwest of Denver and 8 hours north of Phoenix, Arizona. 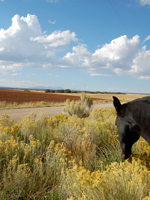 The ranch offers lodging, retreats and workshops. We invite you to join us for memorable and renewing experience, today. Take Hwy 491 to Dove Creek, Colorado. About 2-3 miles West of Dove Creek, take Hwy 141 North toward Egnar. Go 4 ½ miles to Road C and turn right. Go exactly 2 miles to a left turn on Road 7.7. Just past Road B, on the right, you will see a white and green arch that says Sun Canyon Ranch, keep going. Next you will see a small wooden building, keep going. Make a right turn into the next driveway where you will see a wooden arch with a large silver circle, and a wood fence. Park and walk under the arch to the main house. You may be greeted by a few friendly dogs. Great Lakes Airlines flies into Cortez, Colorado, a one hour drive from the Ranch. United Airlines flies into Durango, Colorado which is located about two hours away. Frontier Airlines flies into Durango and Telluride Colorado, both are about two hours away from the ranch.